Michael John Murphy, born September 12, 1950, has left his mark on the sport of Ice Hockey: his influence reaching far and wide. As a young boy, he attended St. Gabriel’s Grade School in Montreal, and after graduating from St. Jean de Brébeuf College, he went on to study English at the University of Toronto. Mike played for the Toronto Marlboros, and was their Team Captain in 1968. Mike was awarded a spot on the Central Professional Hockey League Second All-Star Team in 1971 and the Ken McKenzie Trophy (CHL – Rookie of the Year) that same year. Mike was drafted by the New York Rangers, and thus began his career as a player in the National Hockey League (NHL). He worked hard on the ice playing for the Omaha Knights, the St. Louis Blues, the New York Rangers and eventually the L.A. Kings. Murphy was the Team Captain for the L.A. Kings for six consecutive seasons and in 1983, he retired as a player with a career total of 556 points in 831 games. After serving for three seasons as their Assistant Coach, Mike became Head Coach for the L.A. Kings, making him only the second person to rise to this position after being both player and captain for the team. Murphy’s career highlights include playing for Team Canada, bringing home a Bronze Medal in the 1978 World Championships in Prague; playing with Gordie Howe in the 1980 NHL All-Star Game; participating in the Stanley Cup play-offs; and serving as Head Coach for his favourite boyhood team, the boys in ‘Blue and White’, the Toronto Maple Leafs. As part of his extensive coaching career, Murphy was Assistant Coach for Team Canada during the 1989 World Championships in Switzerland. He was also Head Coach or Assistant Coach for the Vancouver Canucks, the Milwaukee Admirals, the Toronto Maple Leafs, the New York Rangers and finally the Ottawa Senators before accepting the position of Senior Vice President of NHL Operations at the conclusion of the 1999 season. In this position, Mr. Murphy shares his extensive experience and wealth of knowledge of the sport, using both data analysis and his own keen instincts for the benefit of the NHL’s thirty-one teams. In his view, every game counts. “Mike brings (a) wealth of NHL experience as a player, coach and administrator that few can match” – Colin Campbell, Executive Vice President and Director of Hockey Operations of the National Hockey League. Mike is a long-time Aurora resident and father of four who is quick to honour those who have helped him succeed. He remembers fondly the support of his parents, Thérèse and John, whose many sacrifices enabled him to pursue his dream of playing hockey. In 1996, Mike founded the Murphy Hockey School at the Aurora Leisure Complex, a place where young athletes can pursue excellence in the sport of Ice Hockey. 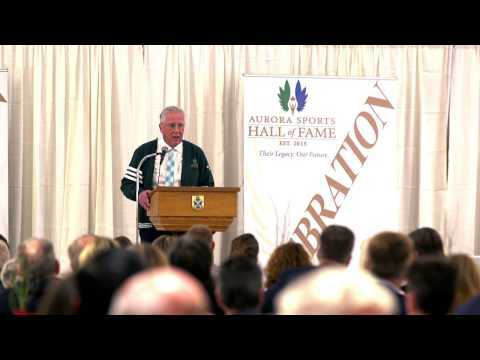 We welcome Mr. Michael “Murph” Murphy to the Aurora Sports Hall of Fame in the Athlete category.